The remains of the former Royal Palace of Medina del Campo (declared a cultural interest site in 2003) now houses the Queen Isabella of Castile Interpretation Centre, as it was one of her regular residences. What’s more, within its very walls she read her last will and testament ultimately passed away on 26 November 1504. A vast Palace built with skill and opulence. From later, in the time of the House of Trastámara, we have multiple references to Castilian monarchs staying at this palace. From the fourteenth century on, Medina bore witness to royal weddings, court trials, battles, fairs in the Plaza Mayor, and so on. In short, there was a very open and international atmosphere in Medina. 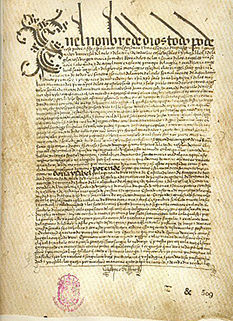 It also played host to major events of the Crown of Aragon when Fernando de Antequera, habitual dweller in the palace, Lord of Medina and younger brother of King Enrique III of Castile, was proclaimed King of Aragon, with highlights including the birth of Alfonso V of Aragon in 1394 and Juan II of Navarre and Aragon in 1397 (father of King Ferdinand the Catholic). The Catholic Monarchs, perhaps its most important inhabitants, chose the Royal Palace of Medina as one of their usual residences. 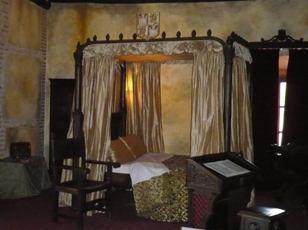 Here they resided for long periods, and Queen Isabella the Catholic read her last will and testament within the Palace, ultimately passing away on 26 November 1504. Isabella would often visit Medina del Campo, even as a child. She was twice bequeathed this town by her brothers: once in 1467, by her younger brother Infante Alfonso; and again a year later by King Enrique IV, her older brother. The court of the Catholic Monarchs was constantly on the move, but Medina and its palace appear as one of the main destinations and stopovers of Ferdinand and Isabella, especially at Easter, Christmas or in the summer. Medina always remained loyal to its queen, so the town was granted tax exemptions. However, the event for which the Royal Testamentary Palace would gain fame was without doubt the fact that it was chosen by the Queen to spend the last months of her life and read her last will and testament, ultimately passing away on 26 November 1504. The last royal event that would take place within its walls was the proclamation of Juana I as Queen of Castile in absence while still in Flanders. After the death of Isabel, Ferdinand also resided here on several occasions. Empress Isabel, wife of Carlos V, lived here in 1552, as did King Felipe II fleetingly in the late sixteenth century. On 12 October 1504, Isabella read her last will and testament to her notary Gaspar de Gricio. On 23 November of that year, she amended and extended some parts of it through a codicil. It was a closed “in scriptis” will. In other words, the testator, the Queen, pronounced her will in private or in secret. Once finished, the document was folded and closed with seven cords, leaving the ends hanging to place the seals of the witnesses. The will was written on parchment leather sheets with full crease marks, folded in half in book form and consisted of 5 sheets, with 19 written sides with court hand script and leaving a blank space on the covers for the seven summoned witnesses to sign, write their name and seal the document. After pondering her last wishes, in the codicil Queen Isabella added and clarified certain issues that complemented the will. 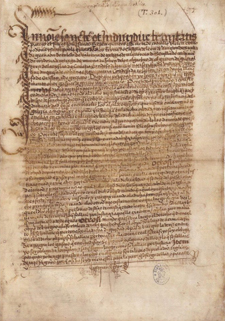 The codicil had the same form as the will, with two pages with 6 handwritten sides and decorated with capital letters degraded at the beginning. After the death of Isabella the Catholic, the residential complex had different uses: as a trading building (in relation to the fairs that were held in the Plaza Mayor); as a jail; as offices of the city council, etc., until it was declared a Cultural Interest Site by the government of Castilla y León on 21 May 2003, recognising it as the place where Queen Isabella the Catholic lived for the longest time and where she read her will and ultimately passed away in 1504. 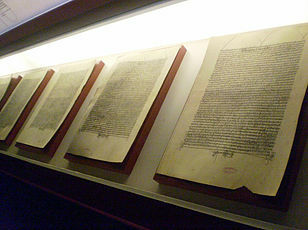 On 26 November 2003, after a complete renovation of the building and preparation as a museum, the Royal Testamentary Palace of Isabella the Catholic opened to the public as an Interpretation Centre of the historical figure of Queen Isabel. Visitors to the centre are given an overview of the historical significance of the Queen. Through videos and interactive resources, different aspects of her life (her childhood and youth, reign, religious beliefs, etc.) are shown, as is a replica of her will and codicil supported by an interactive resource that explores its contents. And finally, there is a copy of the Eduardo Rosales painting “Isabella the Catholic dictating her will”, dating from 1864. 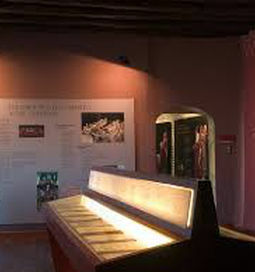 The Interpretation Centre was extended in 2007 to include an interactive room detailing the third voyage of Christopher Columbus to America, as this final expedition was largely defined and mapped out by the Catholic Monarchs within these walls.